in Poznań - first Polish church? The survey has been carried out inside the Church of The Blessed Virgin Mary in Poznań. 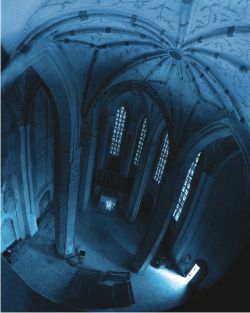 The testing area was divided into areas of crosswise and lengthwise scans with the omission of spots inaccessible to the GPR, such as columns and altar. The total area of 190 m2 was profiled. The shielded antenna of the frequency of 250 MHz was used, because of the range and resolution of the readout. 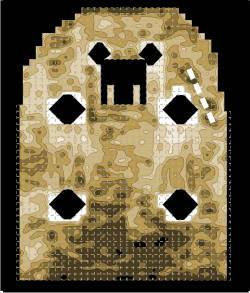 This yielded readouts to the depth of approximately 4 m.
The profile grid was situated relative to the church floor tiles in order to facilitate orientation both during the GPR survey and possible archaeological excavations. 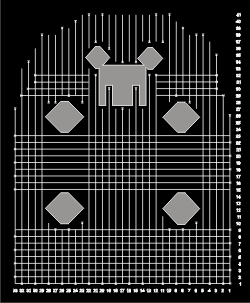 The exact plan of the floor with the profile grid is shown on the drawing beside. Profiles were subjected to the process of signal treatment (amplification according to the properly selected curve, removal of the coherent noise, central-pass filtering, migration, Hilbert's transformation), and subsequently integrated creating a spatial solid. Thus, it was possible to perform the so called time slicing, that is, horizontal projections from the selected depths. The depth range of the projections was selected in order to highlight anomalies. Each time slice was shown in the form of a contour line. The darkest spots present anomalies of the highest signal amplitude. Shapes visualised in this manner represent the layout of possible objects under ground on a given depth. The presented results show the layout of anomalies caused by the existence of the under ground structures. Some of them are the residues after former buildings. The results presented below show particular time slices.